How to Make Your Restaurant an Instagram Sensation? App Builder Appy Pie: Food is an important part of our lives and takes up a great amount of space in our everyday lives. It is around food that we socialize and that has been so, since times immemorial. Whether it is an evening out, a special romantic dinner, or even just a casual catch-up with friends over a meal, it is the social melting pot for all of us today. The other thing that has emerged as a social melting pot is the social media networks. Today everything people do in their lives, they like to share on their favorite social media network. When it comes to photos or any other visual content, Instagram as come to take the mantle as the leader. One thing about food is that we first consume it with our eyes and then with our mouths. And this is where Instagram becomes a key element of marketing for people in the business of food. People like to share photos of what they are eating, how they are dressed when they visit the restaurant or are out for the night, and they also like to look at what others are posting. Instagram is the perfect place to do that, and to do so using their smartphones even as they are on the go! Restaurant owners and marketers can leverage this possibility in an efficient manner so that the passion for food and for the social media can come together to help the restaurant gain popularity. It allows you to share some amazing pictures of your food while creating a space for you all to interact with the customers before, while, and after they visit your restaurant. This is one of the hottest marketing techniques for a restaurant today and it is absolutely free! 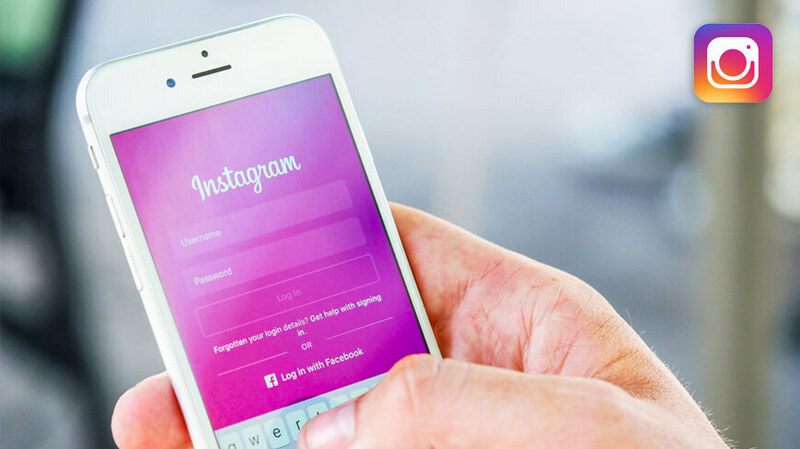 Now, for a beginner it might be confusing and frankly a little overwhelming when it comes to employing some great Instagram tactics which would bring in marketing benefits to the restaurant. 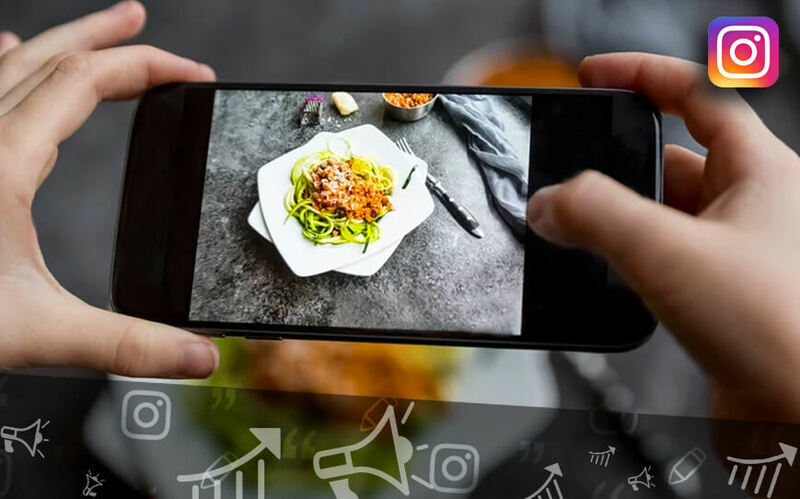 Hence, at Appy Pie, we have integrated a list of tips that can help your restaurant become the next Instagram sensation. If you are not searchable or visible to your audience, what’s even the point of going social? So, it is important that you choose your Instagram username wisely and go for something that is recognizable. Also, develop a profile that uses the relevant business keywords in your profile so that you can boost up your search results and rankings. You can even make use of hashtags for this (more on that later)! The content that you put up must also be easily shareable not just on Instagram but also on other platforms. The pictures that you take for Instagram should be something that should be essentially your pièce de résistance. Now, when you are doing that you would not want the pictures to look all washed out or full of noise. It is better not to use a camera flash or any other harsh overhead lights. It is far better to take pictures near a window or a softer light source for a picture that has a more natural appeal to it! Quite like Fashion photography, food photography can gain depth and a sort of completeness with the right use of accessories in it. Which means when you have an interesting range of silverware supporting a gourmet dish you made in the restaurant, you are going to take the visual experience up several notches. When you are showing off a premium champagne, showcase a bottle of bubbly that has just been opened for theatrics. Add some color to the table with bright dinner napkins and brighten up the pictures. Let’s admit that not all the food we love looks as beautiful as you would want them to. The food that has a mushy texture doesn’t look fabulous, but it can be made to look so with garnish that contrasts it in terms of texture and color making the whole picture pop! For example, if you have a bland looking soup you could garnish it with a richly colored parsley sprig to break the monotony and add some life to it. Adding some gorgeous filters to make the picture quality better. There are a lot of different platforms that you can use to edit the pictures, crop them, or modifying the colors. You can even add some great frames and clip art or make some great picture collages. When you are adding pictures to your Instagram account, it is important to showcase more than mere menu and the food. 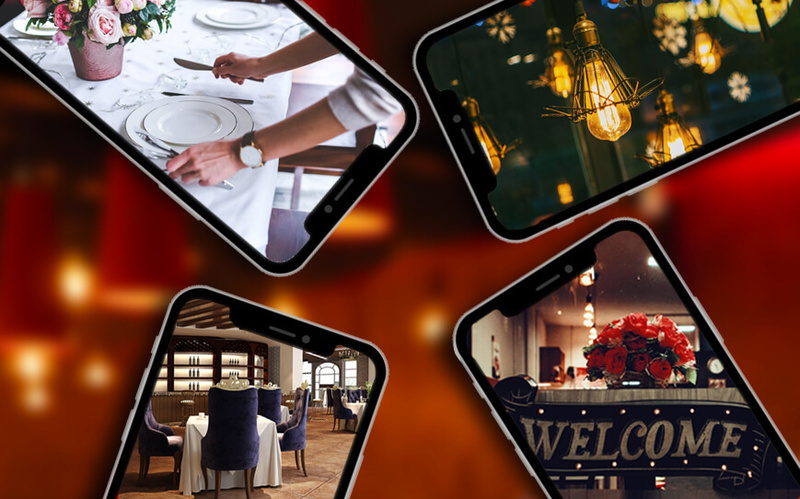 Use this profile to build up a warm and inviting image for your restaurant with pictures of the interior, take some pictures as the staff goes about working and doing their thing, or even the guests as they are enjoying their time at your restaurant (make sure you get their permission first). 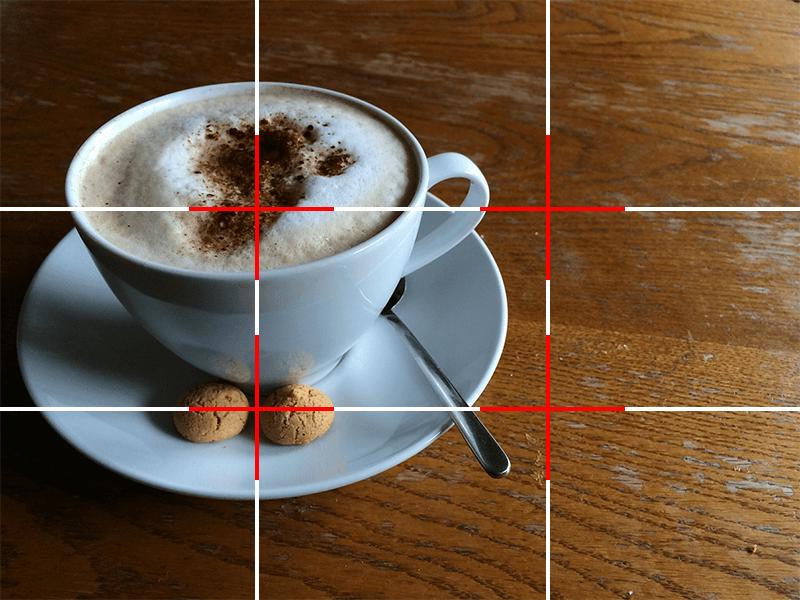 While taking pictures it is important that you remember to follow the rule of thirds. The front and center pictures might be okay once in a while, but largely it is the rule of thirds that add a dimension and interest to your picture. This can be done by imagining that your picture is being broken into thirds, horizontally and vertically. Once that is done, you would end up with 9 sections in total. As a rule, when you place the objects of interest at any of the 4 intersections (marked in red) thus formed, you would have a visually appealing composition in your hands. Though Instagram lets you take pictures from within the app, it is but a better idea to use the regular camera or the camera of your phone (if it is any good) for taking pictures of a better quality. Using a regular camera gives you the added advantage of being able to use advanced features like optical zoom. Once you have taken the pictures, you can use Instagram then to access the file, use the amazing tools and filter library to create flawless visuals for your Instagram posts! The strategies for your in-store marketing might have been working pretty well for you, but the real fun would begin when you learn to incorporate one into the other and formulate a strategy that has an interesting blend of the two strategies. The people who are already walking in to the restaurant are your brand ambassadors and a great medium for word of mouth publicity, but chances are, they are also active on the social media and are probably already posting on Instagram about you and your establishment, or maybe they are not aware of your presence there! Let’s remedy that situation and bring in some clarity. Let people know that you are there on Instagram when they interact with anything or anyone in your physical store. You can mention your Instagram handle on the receipts you are handing out, on your restaurant menus, or even your restaurant flyers. Even better if you can get your staff to talk about it and spread the word about your Instagram account. You can even let your servers at the register tell your customers that if they followed your restaurant on Instagram they can get a discount. Most of the people who follow you once would keep following you for longer if you were posting quality content on your Instagram account. The Instagram feed that you build up on your account is essentially a representation of your brand. Any potential customer that you may be targeting through your Instagram account would first go through the feed and it is entirely on the basis of the looks and aesthetic appeal that they are going to decide whether or not they want to follow you and take the association or relationship any further. It is a good idea to maintain a consistency in your posts by following a certain theme that you can maintain like maybe a certain color scheme, a special editing technique, or a unique style of photography. The more content you post on Instagram, higher are the chances of you and your restaurant being discovered by the right kind of audience. In general, it is a good idea that you post at least once a day, but you can choose to post more often or less frequently as it works best for you. As a general rule however, you should avoid posting too close together and space out the posts by at least 4 hours. The best thing to do is test out posting more content and then less, to understand what works best for you. 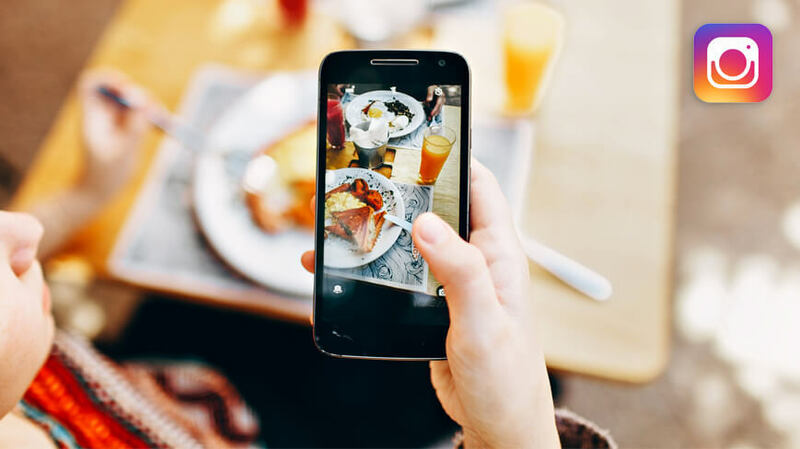 Though Instagram might be the best match for you and your restaurant business when it comes to marketing, it might still be a good idea to mix it up a little and overlap Instagram with all of the other social media accounts you have for your business. There might be some people who would not follow you probably on Instagram but still be happy to follow you on other social media channels like Facebook, Twitter, Pinterest etc. When you share content on all your networks to increase the reach, views, impressions, and most importantly the number of followers. The new embed feature from Instagram lets you add photos and videos to the website and blog for your restaurant without having to get into HTML coding. The web embed feature is user friendly and just lets you copy and paste an Instagram photo’s code to conveniently place the image on your website or blog or wherever you might want to. Print your Instagram account handle and other social media channels on to all your marketing materials including the menus, or the sign on the sidewalk. It is important, however that you keep your clientele in mind while integrating social media into your restaurant’s marketing plan. Though the people who are hashtag happy might appreciate a fast-casual restaurant, but the more classy and elderly people who are looking for an upscale establishment might not be the best target for your hashtags strategy. If you build a business account on Instagram you would have a view of the times when your followers are actually coming online and interacting with the posts you put up. Once you have this information, you can simply make a note to post during that time specifically and set some reminders for yourself. Not just this, timing for your discount posts would also be governed by this because any lucrative offers, events, discounts, or coupons should be introduced at these times when you have the maximum exposure, hence more takers! This also goes for any special days like national holidays, festive season, or even weekends. This is where the traffic data can help you out in a big way! For example, if you have a bakery in your restaurant and Christmas is just around the corner, you would be posting relevant content, but the perfect timing would be determined by the data that you get in your business account on Instagram. So, you have a wonderful Instagram account with fabulous photographs that talk about your restaurant and let people take a peek into your restaurant in a virtual manner. You are definitely attracting a lot of attention and interest from just the right kind of people and people are showering you with their likes and following you in hordes. That’s great! This is now the right time for you to take your Instagram experience for your customers or followers up a notch and do something that would add great value too! As of now, what is happening with your customers is that they are checking out all those wonderful Instagram posts on their smartphones and then if they want to order, they would have to leave Instagram and go to your own app, or website or make a call to place the order. There is a good number of your Instagram followers who would probably not take that direction and think about ordering in another 10 minutes, and in those 10 minutes come across something else that grabs their attention and end up ordering from some other place! Now, you don’t want that happening, do you? So, what do you do? Simple, add a Start Order, or Order Now button on your Instagram profile to nudge your followers to order with ease! This way, you are getting a whole new ordering channel for your restaurant. Isn’t that exciting? One of the big names in the food industry to do this first is ChowNow who have made this integration offers to their followers the ease and ability to order food directly from the Instagram profile of the restaurant. This means that the followers you have on Instagram are not just scrolling down but also ordering by simply tapping on a button. You can do this, for the same results! Who doesn’t like a good contest? When you have established a strong following on Instagram but have noticed that you haven’t really been able to interact with them much or build any kind of connection, then it is time you offer something special and exciting to them. Design a visually appealing ad campaign that offers lucrative discounts or vouchers to your followers in exchange for a shout out, a like, follow, share or a mention with suitable hashtags. Announce your giveaways, ask questions that would elicit a response or reaction, or even re-post content from your customers and give them a shout out! Go creative while designing these campaigns! Your user research and the demographics that you cater to, would come in handy while designing these campaigns. For example, if you are designing a campaign for a gourmet restaurant, then your clientele would probably appreciate a complimentary glass of wine to go with their Hors d’oeuvre. But when you have an all-American diner, you would probably do better to offer to your patrons a free side to go with their meal! When in the restaurant, you can encourage your patrons to take a picture that best defines their experience at your restaurant and post it on Instagram with particular hashtags and mentions, and in exchange offer them vouchers for next meal, or some such offers, so that more people know of your fun offers and discounts. The idea is to come up with a campaign that would be best suited for the audience that you are trying to cater to! Once you are done with that, make sure that the visuals you put up are top quality and attract your audience and spend some time reading it and then engage with it. It takes time to build up a following on social media, quite like it is tough to have loyal customers or returning customers in your restaurant in the real world. Everyone is looking for engagement and the Instagram profiles that can manage to forge a meaningful connection with their clientele on this social media channel are the ones that shine among the rest. One of the most creative ways to do this is create a fill in the blank post. Pinkberry have been able to do this pretty well by posting a post like “The best #pinkberry frozen yogurt flavor is ____” which encourages people to interact with the post. Everyone likes to feel valued for their opinions, and when it is about customers, it is always great to have their opinion about everything that’s going on at the restaurant. If you have introduced a new item on the menu, have revamped the interiors, added a bar counter, or any new campaign, it is great to know what your patrons and followers on Instagram think about it. Once you have gotten the customers to invest their opinion in any such decision, they would be tempted to keep following up or interacting with you and the content you post on your Instagram profile, thus making your restaurant shine among the zillion others on the platform. However, just acknowledging their opinion or interactions with the profile or your content is not enough. You would have to work out a way to make sure that they have something to look forward to. This where rewards come in and fill the void. Any Instagram follower who has more than let’s say 400 followers may be rewarded with a fun deal or free goodies if they mention you with a hashtag or tag you in a post. This will benefit you in a big way too, because you got exposure to their followers without having to pay for it! It is only expected that a restaurant would go big with food pictures and photos of the dishes they are serving on the menu and if they really want to promote themselves they might just do a special photoshoot for off menu items. However, that is not all that the restaurant is about. You can come up with some creative ideas and post some great shots of the farm and food suppliers, special events or festivities, events for social or charitable cause, or any off-site catering or activities pertaining to the restaurant. This means that while it is obvious that you would want to include pictures of all your appetizers, entrées, desserts, the décor and the interiors of your establishment, you should also think about including pictures of your staff and some behind the scene moments which would make the followers feel connected to your establishment and humanize the restaurant as well. You can capture moments where the staff are serving the customers, are simply having some fun together at work, or as they are busy prepping for any big event. Capture the energy in the kitchen and the calm relaxation that you offer in the dining area. Some of the photos might need some explanations while others would give the followers something to talk about. You can also leverage this platform for making announcements like introduction of any new dishes on the menu. You can also introduce your signature beverage or the house wine with a flattering picture so that your followers know about it and are reminded of it. This would work on both, the existing customers and the newcomers. Food can be your daily ritual, a celebration, an event, a romantic endeavor, or an official meeting. Whatever it is maybe, at a restaurant, it is always special. If the food you serve at the restaurant is mundane, the patrons would not have much to come back to you for. In addition to the flavor, taste, the aromas, the service, the ambience, and the décor, one more thing that the customers are going to take back from your establishment are the memories they make here. While they might be having a great time with you, it is important that you help them create and keep the memories fresh for a long time. Now when the patrons take a picture of what they are doing while they are at your restaurant, and post these on Instagram, you are definitely going to emerge a winner here. So, encourage them, give them a nudge so that they take pictures and then post them too! Offer the patrons an incentive like featuring the best photos posted on Instagram with the right hashtag, on your restaurant walls or showcase them in your next campaign. Offer them a coupon code to be redeemed on their next visit to the restaurant, if they post a great picture of your restaurant. We have all heard and read stories that were told with words. The stories that would take us to the destination they spoke of. However, we, as humans are visual by nature and when it is a visual tale, we are attracted to it a lot more easily. When you have a series of lovely pictures, or even just one strong picture, you can use it with minimal captioning to tell a story of your own. It could be a series of pictures that are about the latest event you are hosting, a wedding that you are catering, or a charity event that you are contributing to. Tell your story with visuals. You could talk about the latest remodeling project in your restaurant, addition of a new firepit, or even just a regular day at your restaurant! The idea here is to engage your followers in a tale that talks about what you are doing every day, how your staff spends their day, the good deeds you do, the bad days you had, or just a happy day! As you do this, you would be humanizing your establishment and offer the followers a chance to know you better, to know what you go through, the hardships, the struggles, and the rewards of the day. Hashtags on Instagram are simply amazing. You or your followers can follow certain hashtags if you wanted to. This means if you were to choose the right hashtags, you would be able to gain the benefit of visibility by virtue of it and find the right kind of audience too! Hashtag can be one of the key factors in helping customers find their way to you! Find hashtags that best describe the photo you are uploading. For example, if you were posting a picture of a pizza, you should start by using a hashtag like #pizza, then go on to include more related hashtags like #BestPizza #PizzaLove and others. Instagram lets you add 30 of these and it is wise to use them well. When you use the right kind of hashtag, you are letting customers find your restaurant based on the subject. You can even create a memorable, unique hashtag just for your restaurant, that may be quirky and clever so that your followers can find everything about you by simply following your hashtag! Who knows they might even begin posting their own experiences at your restaurant with your own unique hashtag? The hashtag you create must be short, easy to spell, and relatable for the audiences. You can then take this hashtag and use it everywhere including the website, the blogposts, online ads, print ads, branded stationery, and all the other social media channels too. You can even send this hashtag on all communication including restaurant newsletter or other communication that you have with your loyal fans or repeat customers and give them another great channel to connect with you! Influencers enjoy a strong following on the social media and when you indulge in well planned influencer marketing you can benefit from it in a big big way! The reviews from top influencers have the power to make or break your reputation on the social media in particular. When it comes to the food industry there is a good number of influencers which also includes the regular customers who have risen to the status of honest food critics whose opinion people come to trust. When you invite these influencers in to your restaurant can help you spread the word around about your services. Co-marketing is another area in this gamut that can bring you some great results. In principle it is quite similar to influencer marketing except the fact that this is kind of an exchange-based concept. What happens here is that you, as the restaurant would establish an arrangement or kind of a partnership with other businesses that cater to similar follower count and caters to the demographic that matches yours. This can help you market to an untapped audience and as you grow your followership, you can partner with the big players and further expand your audience. The key here lies in choosing well, after giving a deep thought to what your demographics are and what do you want to achieve from this partnership.